Katharina Braun and her family ready to leave for Paraguay, 1926. Preservings photo. Katharina Falk Braun, Mennonite pioneer to Paraguay, South America, was born on 25 November 1890 in Alt-Bergfeld, Manitoba, Canada. She was the sixth of 11 children born to Peter T. Falk (1858-1924) and Anna Abrams (1859-1945). 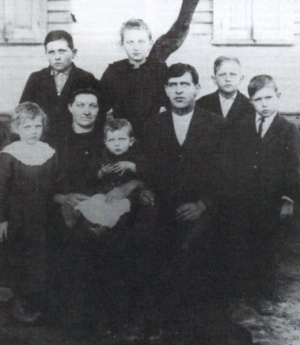 Katharina was baptized into the East Reserve Chortitzer Mennonite Church on 5 June 1911. Later that same year she married Jacob J. Braun (1887-1950) on 28 November. Together they had eight children -- two daughters and four sons survived to adulthood. Katharina died in Puerto Casado, Paraguay on 23 March 1927. Katharina was a strong woman known for her "lively, vivacious" personality and joy of singing. She attended the village school for a few years as a child but learned her more important life skills working on the family's farm in Alt-Bergfeld. Alt-Bergfeld was a very tradition Mennonite village organized in the same fashion as the Mennonite villages in Russia. When the provincial government began to implement new education legislation during the 1920s Katharine's church and other like-minded Mennonite churches began to explore the possibility of immigration as they had done 50 years earlier. Katharine herself embraced the plan to immigrate with enthusiasm. She optimistically looked forward to what rumor described as an earthly "paradise" in South America. It was a place where they could preserve the faith and remain separate from the world. Her enthusiasm was shared by her father-in-law, Jacob F. Braun (1853-1941) unlike her husband and oldest daughter who had strong reservations about the whole plan. Whatever their feelings, Katharina and her family were part of the first group from Manitoba to leave for South America in November 1926. It had been two years since they had sold their farm in Alt-Bergfeld in preparation for the move and so they were eager to get settled and start farming when they arrived in Puerto Casado, Paraguay on New Year's Eve 1926. The Mennonites who arrived in Paraguay at that time were met with disappointment and hardship. The land which they had purchased was not ready. The railway line which was to take them to their new land had not even been built. The lush "paradise" so hoped for turned out to be "primeval Chaco bush, where every plant bore thorns and barbs in a grotesque parody of Eden" with "tall-grass meadows too bitter for pasture and wells of brine too salty even for cattle to drink." Of a truly optimistic nature, Katharina remained cheerful as they set up their home in a one room tent, endured humid searing summer heat and fended off an army of unfamiliar some times deadly insects. Less then three months after their arrival, Katharina became suddenly ill and died two days later. An abdominal hernia from which she had suffered for years had become infected and though a doctor was called nothing could be done. Katharina became the first adult of the Manitoba group to die in Paraguay. She was buried in a Catholic cemetery in Puerto Casado where a headstone was erected in her memory. Katharina's grieving husband and six young children returned to Canada in 1929. Braun, Ernest. "My Grandmother's Song." Preservings No. 10, Part I (June 1997): 43-46. Brown, Sharon H. H. "Braun, Katharina Falk (1890-1927)." Global Anabaptist Mennonite Encyclopedia Online. May 2006. Web. 24 Apr 2019. http://gameo.org/index.php?title=Braun,_Katharina_Falk_(1890-1927)&oldid=91217. Brown, Sharon H. H. (May 2006). Braun, Katharina Falk (1890-1927). Global Anabaptist Mennonite Encyclopedia Online. Retrieved 24 April 2019, from http://gameo.org/index.php?title=Braun,_Katharina_Falk_(1890-1927)&oldid=91217.